Admit it — after the bowl game, weren’t you were worried about the future of the Oregon offense? I was and I wrote about it, as did retired college coach and former Oregon player, Ken Woody. It was an ugly showing that got us all wondering, but as you know about me — I truly spend a disproportionate amount of time thinking about this stuff. (Beyond all normal or rational boundaries of following a team). 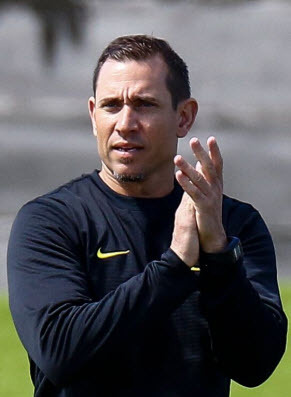 My concern about the offense is not only that Coach Mario Cristobal has indicated an emphasis on running between the tackles, but his recruiting of pro-style quarterbacks and offensive linemen (that order the entire left page of the menu for dinner) has also given me pause about the direction of the Oregon offense. We must not lose our identity, our brand of a high-scoring and entertaining offense, as it is our trademark. I know this from the coaches I talk to and receive emails from. I have been watching and listening carefully to what the media outlets are reporting and now have pulled together enough information from various sources to give us a better idea of where the Oregon offense is headed, and to give us Oregon worry-warts some relief. 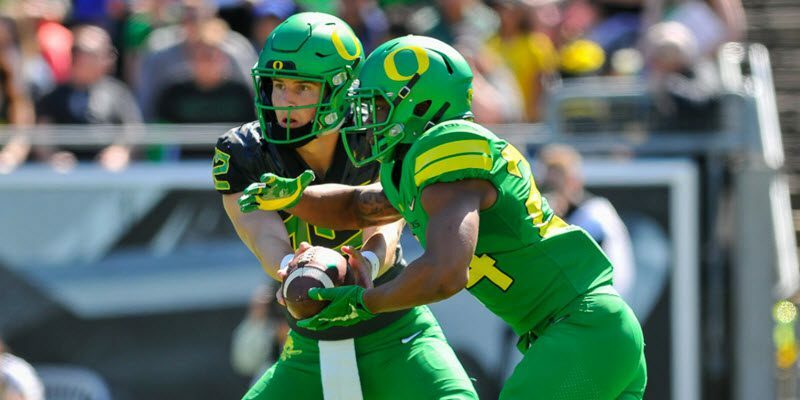 We have had a number of surprises in two other areas as well this off-season, and the impact of these three areas will be profound upon the Oregon offense, and, consequently, changes my August prediction about the success of the 2018 campaign. This means that every freshman coming in this fall can mentally prepare to play, and to get real reps in actual games. This changes the landscape for every position, especially at quarterback for Oregon. 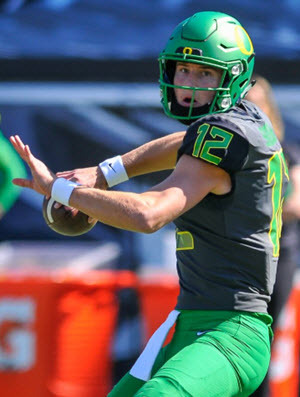 Get the freshman in the game for meaningful reps early on, and if Justin Herbert gets hurt, Tyler is much more ready to help the Ducks this year than in the past years. The impact of these game reps for Shough on next year — when the Ducks are without Herbert is immeasurable. It can be a major component in the success of the 2019 season! Think about all the true freshmen receivers, defensive backs, linebackers and offensive linemen coming in this fall who can benefit from this new rule. Consider how a starting running back could sit out a game or two with dings while a freshman fills in as the third back using his redshirt four-game slot. Special teams could have better talent or at least rest the starters a bit more, and some players, like freshman tight end, Spencer Webb, could get valuable experience without being thrown to the lions. Damn, that’s good. I wish I had thought of that. Oregon is coming back – you can feel it! 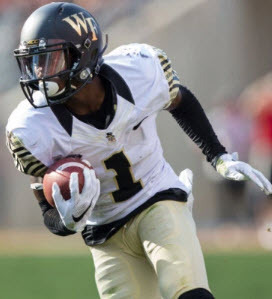 My friends, the addition of a receiver who has over a hundred catches and was on a torrid pace his final four games at Wake Forest (31 receptions!) cannot be understated. His presence changes everything in the passing attack (our next best receiver in 2017 had 42 receptions over the entire season). Tabari Hines will open up all the other receivers and tight ends, and, as a result, the passing attack will be much more intimidating, especially with a future NFL 1st Round Draft pick throwing darts (Justin Herbert). It will also open up the running game, to the chagrin of conference opponents. Let’s be honest; nobody saw these fabulous five coming. They are stunning off-season gifts to the Oregon faithful, laid at the altar of our Duck Football worship from hours of effort by an unrelenting recruiting staff. It will be biggest impact on an Oregon season by “No-Count” players ever. The stamp on the Oregon offense by Tabari will be almost as profound as our first graduate transfer, Vernon Adams. Were it not for a linebacker with a grudge in the first game (the thumb injury), Adams may have taken Oregon back to the National Football Playoff. As I wrote before, I’ve been concerned about Cristobal’s over-emphasis on running between the tackles and by him not utilizing other elements of the running game that I’ve covered, such as the Outside Zone Read, the Sweep Read and the Straddled Triple Option. Keep in mind that Chip Kelly made the Inside Zone Read the fundamental play of his offense, so running between the tackles is essential to all teams. But again … will it be over-emphasized under Cristobal and, therefore, predictable to opposing defenses in the conference? Justin Herbert and Coach Cristobal like what they see of the new offense. I was relieved to see that he wasn’t going to try to win games in the SEC or NFL style with 24-17 type of scores. It is not enough in this conference, and Oregon is not there yet on defense. That huge gust of wind a few weeks ago was yours truly exhaling a long breath of relief upon reading the quote above. That is precisely what I hoped to see, as that variety is what is most challenging to defenses. As I recall, Chip had three colors to identify when the offense would operate in a normal tempo, and then a slowed tempo to run the clock, and a green light or fast tempo. It appears Coach Arroyo favors a similar system when it comes to the “No-Huddle” component of the Oregon offense. My friends … rarely have I heaped such a large article on you, and I thank those who took the time to read it all. 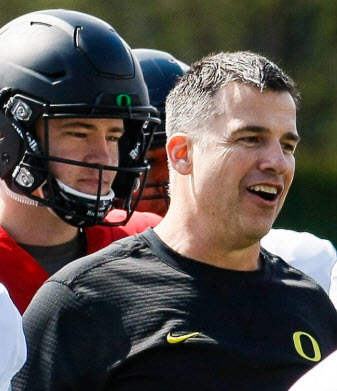 I considered breaking it into separate articles (and usually–I would), but I really wanted to cover all three areas that were surprises this off-season and that will benefit the Oregon offense. We have great times ahead of watching and learning about the new Oregon offense in just a few months.